Over the last few years I've become very conscious of what I put INTO my body, avoiding processed foods with nasty chemical additives and preservatives, opting for local, organic, whole foods over the commercially grown food from 'away'. I even expanded my "urban micro farm" to include a raised bed with cucumbers, peppers, more tomatoes, and herbs! But it's only been recently that I've been questioning what I put ON my body (in the form of shampoos, body washes, deodorant, lotions, bug spray, sunscreen, etc). A few weeks ago I decided to make my own deodorant as I've read about all the questionable ingredients used in commercially made deodorants and their link to cancers. I am going to share something most people would not... I'm a stinky sweater. I sweat A LOT and since I've taken up running, I'm very aware of my own "unique" scent (seriously, my underarms sometimes still smell even right after a shower). I have to say, I'M IMPRESSED!! This is literally the best deodorant I've ever tried (even better than the "clinical" stuff) and it's inexpensive to make! I was definitely a bit doubtful when I found this recipe for deodorant. It really is just a matter of mixing the ingredients together, and I had everything except the essential oil already in my pantry. I will say that since it's coconut oil based the consistency will be almost like a lotion in warm climates, which is fine, I just applied it with my fingers like lotion. When it cools off it will firm up. I put some in a paper Dixie cup and store it in the refrigerator so I can apply it like a standard stick deodorant (just peel the paper back as you need it). 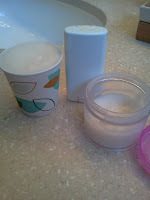 After making my deodorant I found a really cool, refillable stick deodorant container (SCORE)! Can't wait to try it out next time I make a batch! I also keep some in a little container to apply with my fingers. I will never buy deodorant again, this stuff is the BOMB! 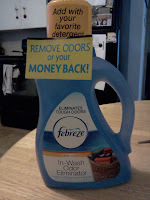 Hot on the heels of my VERY successful deodorant experiment I decided to tackle yet another STINKY issue... laundry. My husband and I both workout regularly and have a lot of "tech" clothing. We've noticed that the tech material seems to really hold on to odors and sometimes has almost a mildew smell. We've been using Febreze In-Wash Odor Eliminator and it works, but it's really expensive. So I followed this recipe for homemade laundry detergent. Besides being economical (averages out to about .16 per load), it is earth friendly and no questionable ingredients. You only need to use 2Tbsp per load (although I'm sure my hubby will use 3... just in case). I just made it today, so no reviews on it's effectiveness, but I'm hopeful! Next on today's agenda is homemade body wash! I'm planning on making mine lavender scented (I have lavender essential oil leftover from making my deodorant). It's very simple, only 2 ingredients (3 if you opt to use essential oil for scent) and water. 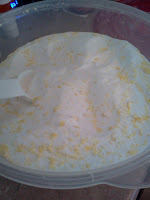 I have another recipe using coconut milk and a few other ingredients that I will try at a later time. I made sure to save an empty bottle from the body wash I used to make it easy to dispense. I'll be sure to post a review when I've tried it out as well! I've been looking for homemade shampoo recipes and there are a TON out there. I'm wondering if any of you have homemade shampoo that you really like? UPDATE: OK, so I just made homemade shampoo and body wash and couldn't WAIT to try it out (and I haven't showered since my run this morning... DON'T JUDGE)! The shampoo has a very thin/water consistency so pour with care! I put it in an old shampoo bottle with a squeeze top, you only need a little (maybe a teaspoon). It lathers nicely and my hair feels squeaky clean (since it's the weekend I'm letting it air dry so not sure if it affects styling). So far 2 thumbs up (and it smells really nice)! The body wash as also a success! I put it in an old foaming hand soap bottle for easy dispensing (it also has a rather thin/watery consistency) and it worked like a charm. Three pumps on my scrubby was all I needed for my whole shower! For comparison's sake I will make the other body wash recipe next time (I have all the ingredients and it makes a much bigger batch making it super affordable) and decide which one to keep! I'd love to hear what you think! Would you consider trying any of these recipes?